Note: The e-book-related guide below is for owners of Android phones. Here’s one for Windows phones. This video created by YouTube user mzchyf may seem complicated at first. But that’s why we’re here—to offer tips ourselves or else help you get answers from experts.The YouTube shows Moon+ Reader in action. It’s a very well-regarded Android application available from the Google Play Store. Moon+ is phone-friendly. It lets you download and read many thousands of free e-books from Project Gutenberg, Feedbooks, ManyBooks, the Internet Archive and elsewhere without your having to use a Web browser, although that’s still an option. Commercial titles are also available, from Feedbooks and Smashwords. Yes, Moon works on just about any Android phone or tablet. And it comes in both a free version (with ads) as well as a low-cost paid one called Moon+ Reader Pro (without ads and with useful wrinkles, such as the ability to read books aloud). The above video features Pro. The app has changed since the making of the YouTube. But the basic concepts will still be useful. You can read the reviews to help understand what’s different from the old version. Also, watch the Download Video Preview tour of the new Moon and check out some screen shots from Moon itself, via the Play Store. The image to the left shows Moon’s fancy note-taking and highlighting capabilities. You can even e-mail your notes to yourself. The cost of $5US for the Pro version is well worth it. But you can still enjoy books a lot with the free one. Any negatives? Alas, Moon can’t read books “protected” with an anti-copying technology called digital rights management. But via sites such as Gutenberg and Feedbooks, you can discover both classics and modern books without DRM. Besides, once you’ve installed Moon, you can go on to install the Kindle Android app or other commercial choices from the Google app store. Moon+ comes with built-in displays of catalogs from Project Gutenberg and the other sources mentioned here, with one exception, the Internet Archive—valuable for the size of its collection. The omission of the Internet Archive is easy to fix. Here’s what you do within the new Moon+, shown to the right or below. 1. Just tap on the three lines in the upper left of your screen. If you’re in a book, you’ll probably need to hit a left-pointing arrow first, the one at the top of the screen. 2. Choose Net Library. That’s the screen showing the catalogs from Project Gutenberg and the other treasure troves of literature. 3. Tap on the three dotted lines in the upper right of your screen. 4. Now tap on Add new catalog. Here is a list of book catalogs for Moon as of 2013 (not to be confused with the screenshot below—showing books as they are displayed with the new Moon+ Reader Pro). May there someday be a catalog of books by Zimbabwean writers! The catalogs mentioned here are based on a standard called the Open Content Distributing System, and a savvy techie could implement the standard for the national library system. Books still under copyright would not be available in full unless the readers paid first, just as they do for O’Reilly Books. Questions? Email our tech guy of the moment and say in the subject line MOON READER TECHNICAL QUESTION. These instructions have just gone up, and we’re eager to clarify or correct if need be. 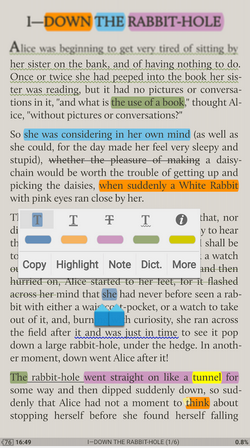 Additional Tip #1: If given a choice of formats, choose the ePub standard. It’s among the ones most likely to be around a long time. Additional Tip #2: If you buy Moon+ Reader Pro and want to hear a high-quality male voice read your books, consider the Acapela speech engine application, buyable at the Google Play Store. Within Acapela, purchase the “Peter” voice to hear a British baritone. One of the best U.K. female voices, “Amy,” is from Ivona, another speech-engine company, whose offerings are also at the Play Store. Additional Tip #3: Having problems with screen glare? Use light letters against a dark background, by way of the Themes feature mentioned in the first video, the one from YouTube user mzchyf. Another strategy would be to select the bold option within the “Visual Options” manual (reachable by tapping a gear-like icon). Then you can turn down the brightness a bit and save battery life along the way. You’ll still see enough perceived contrast between the background and the actual words. Options like all-bolding are one reason why we are so gung ho on Moon. Wikipedia compared e-readers and this one has the most features. Additional Tip #4: If you don’t like Moon, another excellent e-reader to check out FBReader, also enhanced with built-in catalogs. Still another would be Aldiko, owned by Feedbooks. Aldiko can read most DRMed books in the ePub format. Most. One problem with DRM is that nothing is a sure-thing. If you want to own e-books for real, aim for the standard ePub format and try to avoid DRM. The PDF format will also be around a long time. But it’s generally hard to read on small screens like cell phones’. We are anti-piracy. But we want people to be able to enjoy their books easily on a number of machines. They also should be able to back them up and even pass them on to their children without fear that they will lose access if the DRM provider goes out of business. One trait of the best literature is its permanence, which DRM diminishes.